February 3 is the 34th day of the year in the Gregorian calendar.There are 331 days remaining until the end of the year(332 in leap years). 1953 – The Batepá massacre occurred in São Tomé when the colonial administration and Portuguese landowners unleashed a wave of violence against the native creoles known as forros . Year 1112 (MCXII) was a leap year starting on Monday of the Julian calendar. Ramon Berenguer IIIthe Great was the count of Barcelona, Girona, and Ausona from 1086, Besalú from 1111, Cerdanya from 1117, and count of Provence in the Holy Roman Empire, from 1112, all until his death in Barcelona in 1131. As Ramon Berenguer I, he was Count of Provence from 1112 in right of his wife. Jiles Perry "J. P." Richardson Jr., known as The Big Bopper, was an American musician, songwriter, and disc jockey. His best known compositions include "Chantilly Lace" and "White Lightning", the latter of which became George Jones' first number-one hit in 1959. He was killed in a plane crash in Iowa in 1959, along with fellow musicians Buddy Holly and Ritchie Valens and the pilot Roger Peterson. The accident was famously referred to as "The Day the Music Died" in Don McLean's 1971 song "American Pie". Charles Hardin Holley, known professionally as Buddy Holly, was an American musician, singer-songwriter and record producer who was a central and pioneering figure of mid-1950s rock and roll. He was born in Lubbock, Texas, to a musical family during the Great Depression, and learned to play guitar and sing alongside his siblings. His style was influenced by gospel music, country music, and rhythm and blues acts, and he performed in Lubbock with his friends from high school. 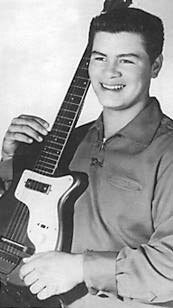 Richard Steven Valenzuela, known professionally as Ritchie Valens, was a Mexican American singer, songwriter, and guitarist. A rock and roll pioneer and a forefather of the Chicano rock movement, Valens' recording career lasted eight months, as it abruptly ended when he died in a plane crash. AD 6 (VI) was a common year starting on Friday of the Julian calendar. At the time, it was known as the Year of the Consulship of Lepidus and Lucius Arruntius the Younger. The denomination "AD 6" for this year has been used since the early medieval period, when the Anno Domini calendar era became the prevalent method in Europe for naming years. Emperor Ping was an emperor of the Chinese Han Dynasty from 1 BC to AD 5. After Emperor Ai died childless, the throne was passed to his cousin Emperor Ping—then a child of eight years old. Wang Mang was appointed regent by the Grand Empress Dowager Wang. Dissatisfied with his father's dictatorial regency, in AD 3, Wang's son Wang Yu (王宇) conspired with Emperor Ping's maternal uncles of the Wei clan against Wang, but after they were discovered, Wang had not only Wang Yu and the Weis put to death, but also used this opportunity to accuse many actual or potential political enemies as being part of the conspiracy and to execute or exile them. From here onwards, the Han Dynasty existed only in name. Furthermore, Wang Mang also designated his daughter as the empress consort to Emperor Ping to codify his legitimacy to power. Emperor Ping was allegedly poisoned by Wang Mang after reigning less than six years, because Wang was concerned that he would avenge his uncles, and his successor, the infant Emperor Ruzi, would be chosen by none other than Wang Mang himself. Saint Ansgar, also known as Anskar, Saint Anschar or Oscar, was a Archbishop of Hamburg-Bremen in the northern part of the Kingdom of the East Franks. Ansgar became known as the "Apostle of the North" because of his travels and the See of Hamburg received the missionary mandate to bring Christianity to Northern Europe. Saint Berlinda was a Benedictine nun of noble descent. Her feast day is 3 February. According to legend she was a niece of Saint Amandus, and was disinherited by her father, Count Odelard, after he became sick with leprosy and believed that she would not take proper care of him. ↑ Zak, Anatoly. "Soviet probe makes world's first soft landing on the Moon". Russian Space Web. Retrieved 1 February 2018. ↑ Wilbur R. Miller (20 July 2012). The Social History of Crime and Punishment in America: An Encyclopedia. SAGE Publications. p. 1110. ISBN 978-1-4833-0593-6. ↑ Marlene Bradford; Robert S. Carmichael; Tracy Irons-Georges (1 January 2001). Natural Disasters: Avalanches-explosions. Salem Press. p. 58. ISBN 978-0-89356-072-0. ↑ "STS-60: A Cosmonaut Flies on the Shuttle". NASA History Program Office. NASA. Retrieved 1 February 2018. ↑ "Kristoff St. John Dead Young and the Restless Star Dies at 52". GlobalNews. Wikimedia Commons has media related to February 3 .